Our products are cast of the highest quality aluminum.Every item is cast by hand which makes each piece unique.All inserts are cast from a marine grade aluminum alloy then polished to a mirror finish that has the same color and shine as chrome.Easy installation with silicone (not included)Our quality standards are very high ensuring the products will last for many years. Custom made allow two weeks for delivery. 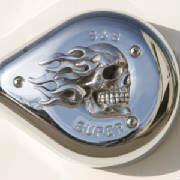 Flaming Skull insert for S&S style air cleaner cover in Marine Grade aluminum polished to a mirror finish. Easy to install with silicone. Instructions included. Air cleaner cover not included. 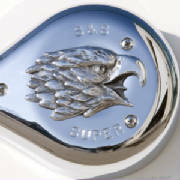 Screamin' Eagle insert for S&S style air cleaner cover in Marine Grade aluminum polished to a mirror finish. Easy to install with silicone. Instructions included. Air cleaner cover not included.